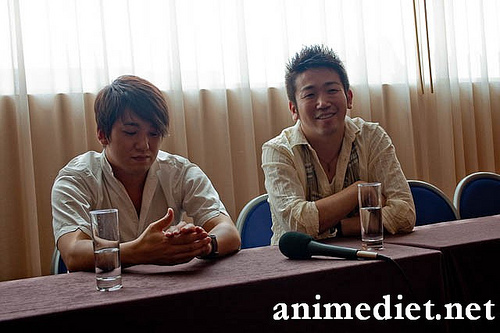 Previous PostMasao Maruyama/Hiroshi Koujina Joint Press Conference TranscriptNext PostFire Alarm Evacuates Otakon…convention war story potential. That’s really cool that you got to listen to the Yoshida brothers. I wish I could be there. I never heard of any live performance of shamisen although I’m from Japan. But I have listened to live performance of sansen, an Okinawa instrument, a root of shamisen. Sounds very cultural. I would say Yoshida brothers are probably more like Blues Brothers, or Allman Brothers, since blues is a traditional American music, and shamisen is also a traditional music in Japan. Both traditional. Yes, definitely Spanish influence on Japanese cuisine. Bread and cakes were brought by Spaniards. Tempura is also Spanish influence. Ee? I thought Tempura was brought about by the Portuegese! At that time, Portugal was under Spain, or joint union. So I say both españoles and portugues. Ah. Wakatta. Yes, obviously I’m not well versed in history. You’re right! Ehh I thought that they were referring to the Spanish Tapas.. I always thought it was the portion that they were talking about. @Monsieur I definitely would like to listen to other types of instruments.